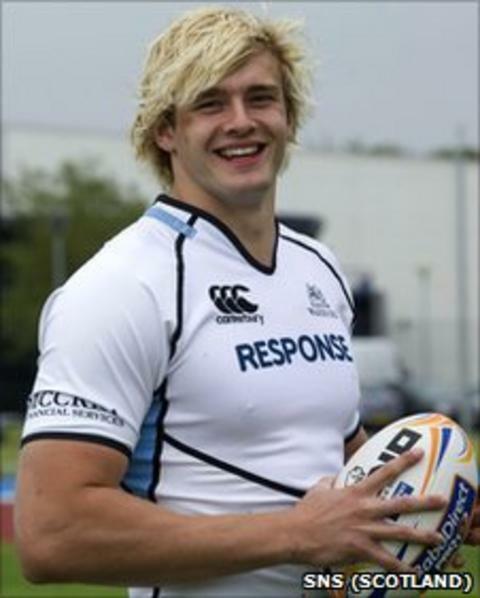 Richie Gray is looking forward to returning to competitive action following a long spell training with Scotland's provisional World Cup squad. Gray will be involved in the first of two warm-up games, against Ireland at Murrayfield on 6 August. "It's been a tough two months - there is no denying that," said the 6ft 8in Glasgow lock. "We are improving as a squad and starting to get a bit of a game plan. Everything is going well." Gray was one of five players withdrawn by head coach Andy Robinson for the final four matches of the Magners League season. The move came after the 21-year-old impressed in Scotland's Six Nations campaign, but he insisted he did not take it as a vote of confidence. "I didn't really look at it in that way," Gray explained. "I looked at it in the regard I had been given a rest and what could I do to maximise it? "The competition is huge and there is no guarantee you will be getting on the plane. "Everyone is fighting for their position. That's the mindset I have and it's the mindset everyone has. "There are no guarantees. I just looked at the rest as a chance to maximise my gym work as much as possible. "The rest has done me good in regards to getting into the gym and working on my fitness. It gave me an extra block to concentrate on. "From a rugby perspective I'm just trying to dust off a few cobwebs in training and trying to get the skills coming back." Following the Ireland game, Italy also visit Murrayfield on 20 August before Scotland begin their World Cup campaign against Romania in Invercargill on 10 September. And Gray is already setting high demands on himself for the tournament in New Zealand. "I will take confidence from last season," Gray added. "I still feel there is pressure on. "I will put pressure on myself to perform. I wouldn't want to let myself or my team down, so I will put pressure on. "I will go into it with the same mentality I do every game - club or international."